– A tube of first aid stuff that they gave away at some City thing I went to on emergency preparedness. Not sure what is in there. It will be a surprise. – Extra pair of glasses. – $100 in mostly small bills, because stores may not have change in an emergency. – A plastic bag containing info about my cats, out-dated forms that say they had their rabies shots (must get current forms) and a list of hotels that take cats. – Tags with my cats name on them and my name and cellphone number. – A plastic bag with info about me, birth certificate, social security number, phone numbers of family, friends, doctors. – First aid kit, the zipper on the bag is broken. It’s got prescriptions, girl stuff, sun block, toothbrush, floss, Motrin, more gauze, bandaids, and lots of Imodium because my worst fear in a terrorist attack or tornado is to have bathroom issues and no bathroom. I used to have an extra pair of sneakers and a pair of jeans in there, but I don’t currently have extra sneakers or jeans to spare. ahhh… now I get it…. Love your postings! Keep writing! 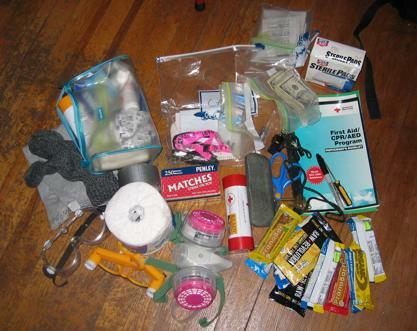 Ever since you mentioned ages ago that you had something called a “Go Bag”, I’ve been wondering what you keep in it. I’ve been thinking that I should put one together and seeing what you have in yours is really helpful. Here’s a couple of additional things that I would put in mine: a wind-up emergency radio (to listen to reports on where to head for food/shelter/first aid) and a couple of big plastic garbage bags (to use as a rain poncho? groundsheet? who knows?). Anyway, thanks for this very helpful post!